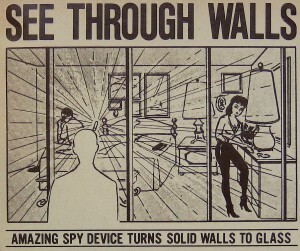 In today’s world, the seeming safety and privacy provided by four walls and a roof is quickly diminishing with microchips enabling mobile devices to see through walls, microchips allowing mobile devices to provide ultra-precise location information, the hijacking of cell phone camerasand even stealthily recording sound and other environmental information, supposedly for advertising purposes. Of course, those examples represent just one of the many ways in which our privacy is being invaded and diminished with a vengeance in the United States today. Now new method is being explored by researchers which could allow people to use so-called “bistatic WiFi radar” at a distance in order to covertly detect and monitor people moving behind walls. The researchers published the findings in a paper called “Through-the-Wall Sensing of Personnel Using Passive Bistatic WiFi Radar at Standoff Distances” in IEEE Transactions on Geoscience and Remote Sensing, volume 50, Issue 4. The emphasis appears to be the ability to detect people “uncooperatively and covertly,” something which is also becoming increasingly important in facial recognition technology and other biometric technologies. The researchers, who are affiliated with the Department of Security and Crime Science at the University College London in the United Kingdom, have demonstrated the first successful through-the-wall (TTW) detection of moving people using passive WiFi radar. [NaturalNews] Two former high-ranking officials at the U.S. National Security Agency (NSA), a federal bureaucracy that collects data and intelligence on foreign communications for national security purposes, have come forward with allegations that the NSA actively monitors Americans as well. According to testimonies from both Thomas Drake, a former NSA senior official, and Kirk Wiebe, a former NSA senior analyst, the agency actively monitors and collects intelligence on every single American as part of a massive spying operation. RT.com first broke the story after Drake and Wiebe, on two recent but separate occasions, disclosed inside information about the NSA’s spying activities to reporters. During a recent interview with Eliot Spitzer, host of Current TV’s “Viewpoint” program, Drake explained how the 9/11 terrorist attacks were a catalyst for redefining America as a “foreign nation” in order to legitimize unwarranted surveillance of innocent Americans — and he says this backdoor spying program continues to this day. “When you open up the Pandora’s Box of just getting access to incredible amounts of data, for people that have no reason to be put under suspicion, no reason to have done anything wrong, and just collect all that for potential future use or even current use, it opens up a real danger,” said Drake during the interview. Binney expressed similar sentiments during a recent interview with journalist Geoff Shively, according to RT.com, in which he disclosed that the federal government is basically collecting whatever data it possibly can on every single American. This is made even easier, of course, by social networking sites like Facebook, Twitter, Instagram, Foursquare, Path, and many others that actively monitor and track people’s every action. Conversations w/Great Minds – NSA Whistleblowers – Are They Spying on the Entire Country? For tonight’s Conversations with Great Minds – I’m joined by NSA whistleblowers Thomas Drake and Kirk Wiebe. Both men were involved in exposing the NSA’s massive, illegal, domestic spying program known as the Trailblazer project initiated in 2000. Despite not leaking any classified information – and exhaustively going through all the protocols required for members of the intelligence community to blow the whistle on wrongdoing – both men faced serious retributions for going public with what they knew about the NSA’s surveillance program. 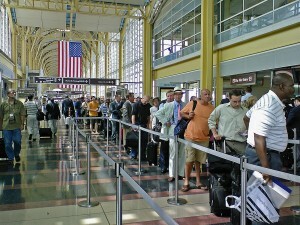 In 2007 – after a reporter for the Baltimore Sun obtained information regarding waste, fraud, and abuse at the NSA – FBI agents raided the home Kirk Wiebe – confiscating computer hard drives and business records – and revoking security clearance that Wiebe – an NSA veteran – had held since 1964. Wiebe was not charged with any crime. However – Thomas Drake – whose home was also raided – was charged with multiple crimes including violation of the Espionage Act of 1917. Eventually those charges were dropped in 2011. Since then – Drake has gone on to win multiple awards for his courage in blowing the whistle on the NSA – including the Ridenour Prize for Truth Telling and the Sam Adams Associates for Integrity in Intelligence. And both he and Kirk Wiebe have done tremendous work to inform all of us on the growing American surveillance state. The National Security Agency is building a massive spy center in Utah. What for? And will Americans be the targets of the NSA’s prying eyes? Drones are becoming more and more a part of the way America does business – they have been used in modern day warfare to target those believed to be dangerous or a threat to the security of the United States, but very soon they will be a permanent fixture on America’s landscape. The FAA has been adopting new rules to expand the use of small drones domestically, and by 2012 UAVs are expected to dominate the country’s airspace. Trevor Timm of the Electronic Frontier Foundation brings his take on whether Americans should worry about what law enforcement is doing. 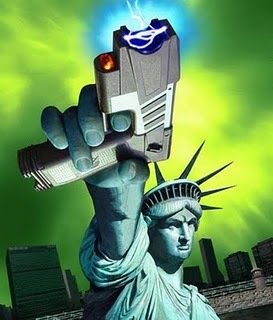 If 500 hundred deaths and countless abuses at the hands of taser-friendly police is not enough to garner any concern by the average American, then perhaps the new “Nano-Second Electrical Pulse” Mega Stun Gun being introduced by the Department of Defense might do the trick. The new stun gun was recently unveiled at the DOD’s Non-Lethal Weapons Industry Day and it works by hitting the target individual with alarmingly high voltage for a very short amount of time – i.e. billionths of seconds. However, the amount of electricity fired into the person’s body, while not specified in terms of exact voltage, will be enough to not only stun the individual but render them unconscious. The victim is supposed to be able to regain consciousness as soon as the flow of electricity stops. However, the Pentagon is predictably working on yet another version of this “improved” stun gun that will render the victim unconscious for several minutes. How dangerous a device like that could be is unclear. Stun guns have a long and well documented history of abuse — even students and grandmas have been victims of overzealous, Taser-happy police officers. And their use, despite being labeled “non-lethal,” can be deadly. According to Amnesty International, at least 500 people have died after being shocked with tasers. In 2008, a jury in San Jose deemed the company that produces the stun gun, Taser International, responsible for the death of Robert Heston, a 40-year-old man who was shot by the cops multiple times. The jury found that the company failed to warn the police that repeated discharges could have a deadly effect on the target. Of course, while the technology itself is obviously dangerous, it is not so much the devices that are responsible for the deaths, as it is the fact that they have been placed in the hands of persons wholly incapable of operating them in a responsible manner. As ludicrously farfetched as the headline sounds, there is in fact a new laser-based scanner built by Genia Photonics – who is currently in “a strategic partnership and technology development agreement with In-Q-Tel” – which can detect traces of just about anything on your person from a stunning 50 meters, or 164 feet away in somewhere around 1/1000000000000th of a second. One must realize that as disturbing as this may sound, it is really not all that shocking when you consider the Department of Homeland Security’s (DHS) Future Attribute Screening Technology or the rise and continuing growth of nearly ubiquitous use of facial recognition technology. Genia Photonics refers to the ability of these types of picoseconds synchronized programmable lasers to be used for “standoff threat detection.” Essentially, this is just a different way of saying the government will soon be able to scan your body, car or belongings for just about any molecule or substance they please without you knowing, all at unimaginable speeds. If this is rolled out as soon as Tara O’Toole, under secretary for science and technology of the DHS, claimed it would be during her testimony on November 17, 2011, it will become just one of many parts of the American surveillance state.